During the summer of 2012 I was in Mount Rainier National Park on a photography trip. As with many days at Mount Rainier – the clouds rolled in and you couldn’t see the mountain – not even the Tatoosh Range. On my first trip there in 2009 I remember explaining to some German tourists (who were excited to see Mount Rainier) while standing in the Paradise parking lot that actually the mountain IS right there… you just can’t see it. I suggested some of the waterfalls but they weren’t interested – they must not have been photographers! So with similar conditions presented in 2012 I photographed Narada Falls instead. There are only so many points where you can see the falls, so doing all that much creative with wider angles is not easy. For this photograph I pulled out the 70-200mm lens to find some details I liked. 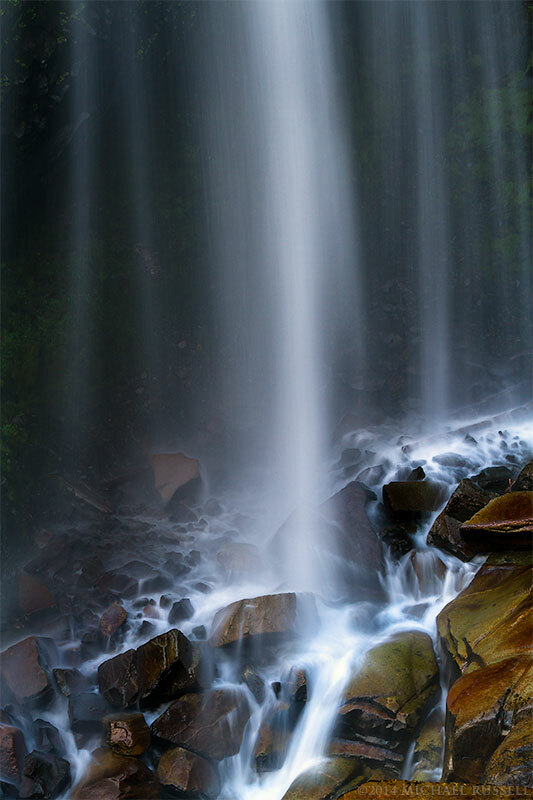 I have a number of photographs of some other details of Narada Falls but I think my favourite is this photo of the water hitting the rocks at the base.. I also chose this photograph to again play around with some black and white conversions. This was my favourite iteration of Narada Falls in black and white from my experimentation. Does this monochrome version work for you? This is such a beautiful image Michael! I really love the smooth water and the tones in the rocks at the bottom. Very nice! I love these pictures. I am also into landscape photography but I am an amateur compared to you. You are a professional. I travelled around the world but 3 weeks in various countries one does not have much time to compose pictures or concentrate on the technical site of photography. I mostly took pictures because emotionally they spoke to me or had certain feelings about them. I not only was into landscape photography but also into wildlife photography in Africa, Asia, America, Australia but also into archeological sites, e.g. Egypt, Thailand, Cambodia, India and China. I always had difficulties taking pictures of people exceptions being children. Your landscapes are amazing and you are a very professional photographer and I like your photographs very much.